I have never read anything so dry as Why Zebras Don’t Get Ulcers in nonfiction that isn’t a schoolbook. Combining cutting edge research with a healthy dose of humor and practical advice, Sapolsky explains how prolonged stress causes or intensifies mental afflictions. 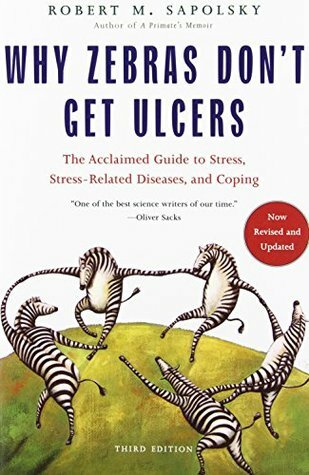 I give Why Zebras Don’t Get Ulcers by Robert M. Sapolsky two out of five hearts because I think there are much better sources for information with the same information that is not as dry and much easier to understand than this book. Robert M. Sapolsky writing is much worse than a schoolbook. I got the feeling that he was trying to put the information of all his schoolbooks on the same subject in one small 300 page book. He throws around medical words as if I am supposed to have studied in the medical profession and I wondered whether I am the wrong audience. If you want to know more about stress and stress-related diseases, I would advice you to use the internet because it is much easier to read than this book. And there are so many much more books that are more easily read than this. This entry was posted in Book Review and tagged Book Review, Nonfiction, Psychology, Robert M. Sapolsky. Bookmark the permalink.